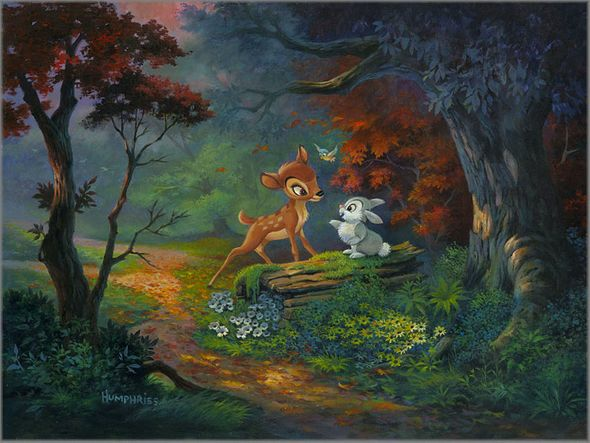 Michael Humphries Hand Signed and Numbered Limited Edition Canvas Giclee:"Friendship Blossoms, A"
Edition: Artist Hand Signed and Numbered Limited Edition to 95. About the Artist: Michael's passion to become an artist began as a youngster growing up in Tampa, Florida. Michael knew his destiny was to draw and paint, and when his family moved to Long Beach, California, his artistic abilities blossomed. Throughout high school, Michael sought every opportunity to observe nature and create art. While in his second year of college, Michael was drafted and served as a member of the Army's 1st Air Cavalry Division's Combat Art Team in Vietnam. Upon his return, Michael continued his art education at the Art Center College of Design in Pasadena, California, where he currently teaches. Michael's professional career began at Walt Disney Studios. While still a student at Art Center, Michael was asked to join Disney's Feature Animation team as a background artist. Michael's film credits include The Great Mouse Detective, The Rescuers Down Under, and The Hunchback of Notre Dame, as well as Academy Award® winners Who Framed Roger Rabbit? and The Lion King. He continued with Disney as art director for The Steadfast Tin Soldier segment of Fantasia 2000, as well as two musical shorts, One by One and the Academy Award nominated short film The Little Match Girl. Michael was nominated for an Annie Award as production designer on Sony Pictures' first 3D animated movie, Open Season. For his dedication to the art of animation, Michael was elected to the Academy of Motion Pictures Arts and Sciences and the Academy of Television Arts and Sciences. Michael's paintings exhibit his fascination with the American landscape and continue to remind us to examine intimate designs in our world that we take for granted while inspiring us to discover those "little things" in nature as well. His attention to detail draws viewers into his paintings and compels them to stay awhile.